Which genius came up with the idea of awarding this plan money? With any luck, this week will be the last we hear of the MTA’s ill-conceived “Genius Competition.” The brain-child of Gov. Andrew Cuomo, the Genius Competition arose in May of 2017 when the governor couldn’t ignore the drumbeat over declining subway reliability and decided to convene a panel hold a contest to fix every problem. It wasn’t well received within the MTA as the agency’s staff members who work hard to keep the subways running felt they were being ignored in favor of the glitz and glamour of a blue-ribbon panel, and the resentment has festered within the walls of 2 Broadway for months, another sign of the disconnect between Cuomo’s people and the MTA careerists. The Genius Competition has taken up time and money, and a lot of the oxygen in the room, as Cuomo has tried to bill it as the thing that will prove people are thinking hard about how to fix the MTA. On Friday, the winners were revealed. The agency doled out around $2.5 million to eight ideas. Some of them — an ultra wideband wireless system for signal technology, for instance — the MTA had already been exploring. Others — a light-weight carbon fiber-based modular subway car designed by CRRC — should be part of the MTA’s ongoing improvement efforts. I’m not going to detail all eight of the winning ideas; you can read the press release or watch the videos detailing the winners. I’ve embedded the CRRC video below as it has some alluring future-tech rail car renderings. But I want to talk about one in particular that won $330,000: Lawyer and transit enthusiast Craig Avedisian proposed, as the MTA put it, “changing passenger loading procedures and adding more cars to trains to increase capacity.” On its surface, that seems like a reasonable idea until you realize that all but a handful of G train stations aren’t long enough for longer cars. On closer examination, Avedisian is proposing an extremely customer unfriendly idea that would involve a third of his longer subway trains not platforming at every other station. And this idea won money from an MTA panel that includes the agency’s current chairman, president, managing director and chief development officer. If you’re asking if anyone is home, well, it’s a good question. There are of course numerous reasons why the comparisons to London fall flat and why this idea should be a non-starter. For a rapid transit system, it is an idea very hostile to riders who would need to know a lot of details about their rides that most people shouldn’t be expected to know, and without articulated trains, it can lead to a situation where riders are “trapped” when they end up in cars that don’t platform at their destination. In practice, as we can see with Amtrak and other commuter rail services, including those serving London, it increases dwell times to levels unsustainable for a rapid transit network. On a technical level, the plan ignores the costs associated with procuring enough cars for every train to be 40 percent longer or with adjusting the length of MTA signal blocks to accommodate longer trains. It’s an excuse for avoiding addressing the real capacity increase: a modern signal system. The MTA will evaluate the system’s busiest subway lines, stations where platforms are long enough to accommodate longer trains, and fleet and yard availability, to further explore applications of Avedisian’s idea. Some subway lines are viable candidates for a pilot program due to ridership demand and their station layouts. A study of fleet and infrastructure availability will be needed for a future pilot program or future car procurement. But why it chosen as a finalist by a panel that included the top MTA leadership officials? In comments to press, Avedisian drew further faulty comparisons. “I think it’s, in concept, no different than local/express, J/Z,” he said to The Daily News. Of course, it’s not the same as an express/local situation in which riders know that every car will platform. It’s a confusing excuse for a solution to problems that can be solved — and that seems to be a metaphor for the Genius Competition writ large. After 10 months, the MTA is a few million dollars poorer and a real solution to the transit crisis remains a far-off spot on the horizon. The Genius Competition seemed like a distraction last year and ended as one this year. The good ideas, as told through hundreds of submissions, should be embraced without the pomp and circumstance of a contest; that is, after all, what a well-run agency would do to usher in its future. But at least Robert James, one of the “winners” for this ultra-broadband idea, can use $250,000 of MTA money to, as he told Dan Rivoli, build his home in Tampa, and isn’t that everyone’s dream? For a few years, I’ve noted that the MTA suffers from something we could call “Didn’t Think Of It Ourselves-itis.” If someone at the MTA didn’t think of it — or if someone from the outside the MTA isn’t funding — the agency not only doesn’t embrace the idea but usually finds a way to dismiss any proposal out of hand with the variety of usual suspects. It’s too expensive; it’s too impractical; it’s too timely; it sets a bad precedent. The list goes on and on. In recent weeks, we’ve seen this drama unfold in response to two different proposals. First, in mid-November, when politicians began to clamor for rationalized commuter rail fares to alleviate the stress of certain transit deserts within the city, the MTA dismissed its $70 million out of hand. “We just can’t agree to accept that kind of loss especially since we already lose so much money on other services,” Adam Lisberg said at the time. These two statements seemed to embody Didn’t-Think-Of-It-Ourselves-itis. As I noted last month, when it comes to multi-billion-dollar expenses — and some projects that could rightfully be called boondoggles — the MTA doesn’t bat an eye, but when it comes to incremental operating costs for customer-friendly initiatives, the MTA suddenly cares deeply about efficient spending. It’s quite the paradox and one that MTA CEO and Chairman Tom Prendergast apparently wants addressed. The MTA boss told agency staff to stop trashing ideas to give riders a break on fares and improve service “out-of-hand,” according to an emailed memo obtained by the Daily News. MTA officials’ response to some recent ideas — such as cheaper commuter fares for trips within the city or extra subway and bus service — “seemed to indicate that we were rejecting these proposals out-of-hand, mostly on the grounds that they were too costly,” MTA chief Tom Prendergast wrote in a message emailed to board members Nov. 29. How this will eventually manifest itself is still an open question, and the MTA is still likely to suffer from other symptoms of Didn’t-Think-Of-It-Ourselves-itis. But a time when service is suffering due to a system that’s too popular for its own good, an organization that can be as insular as the MTA should do all it can to attempt to improve the customer experience. If that means listening and implementing a few good ideas thought up by outsiders, so be it. It’s better, after all, than yet another cranky conductor yelling at riders trying to board a crush-loaded peak-hour train to “use all available doors” as though that will magically fix all of the system’s problems. I recently had the opportunity to look at a calendar, and I was shocked to discover that it’s 2015, by many accounts the 15th year of the 21st Century. Considering how much time has elapsed since the heady days of the Y2K threat, that Limp Bizkit song called, for some reason, “9 Teen 90 Nine,” and unironic promises to “party like it’s 1999,” you would think that the country’s busiest transit agency would have perhaps planned for the 21st Century by now. You could be forgiven for being wrong. Transit officials recently created a new top-tier executive position for the subway system: vice president of 21st Century Service Delivery. The job was given to NYC Transit division veteran John Gaul. Gaul’s will focus on improving customer service, relieving subway overcrowding and spearheading other priorities such as a new fare-paying system to replace the MetroCard, Metropolitan Transportation Authority spokesman Kevin Ortiz said. Color me highly skeptical, but shouldn’t the MTA have been playing for the 21st Century, say, 20 or 25 years ago and not a decade and a half into the 21st Century? On a more practical and less snarky level, none of the elements of Gaul’s job that Donohue described are particularly unique to the 21st Century. If anything, Gaul is helping the agency catch up to where they should have been where the 21st Century dawned. In presenting the story to the Daily News, Transit sources cited a slew of technological advancements and initiatives that won’t wrap for a few more years. We see mention of a new fare-payment system that should have been implemented already and likely won’t be fully installed before a quarter of the 21st Century elapses. We see a nod to the Help Point customer intercom system, a technology rendered redundant by cell phone service and one hardly new to transit systems (or college campuses) across the nation. We see Transit officials hoping that Gaul can work to “relieve subway overcrowding” — something that can’t be accomplished without signal upgrades and perhaps automatic train operations. By and large, these are late 20th century challenges not otherwise unique to our times. So what should a 21st Century Service Delivery ops team work towards? For one — and especially for the MTA — the eyes should be focused on mid-21st Century anticipations. Speed up the pace of technological adoption and work on those B Division countdown clocks with some urgency, but also work to anticipate new transit trends in both customer-facing technologies but also in service patterns. How can the MTA grow today to meet demands of New Yorkers in 30 or 40 years? Inevitably, that would require serious cost and efficiency improvements. Is Gaul up to that challenge? Let’s talk about the old City Hall loop station long out of service. Sitting under City Hall Park and, well, City Hall, it’s a Guastavino beauty that served as the launching point for the crazy, cacophonous subway system we have come to know and, at various times and various moods, love or hate. It closed to passenger service in 1945, a victim of a poorly designed platform and declining ridership. It’s open now for tours, and passengers are permitted to ride 6 trains through the loop from the southbound Brooklyn Bridge platform to the north side. Take that ride during the day if you never have. It’s the closest thing you can find to hopping into a time machine. Let’s also talk about the Transit Adjudication Bureau. The TAB is a quasi-judicial body set up to adjudicate summons issued in the subways and buses by NYPD cops. Since the hearings concern infractions and summons that don’t rise to the level of criminal charges, civil rights advocates, while wary of the TAB, have not gone to the mats over due process concerns. The TAB need not have due process protections required of criminal courts, but so long as some process is followed, it works. When that process breaks down, though, it’s concerning. A few weeks, Joshua Patchus wanted to catch that City Hall stop, and so he and a friend rode the 6 through the loop. His subsequent blog post gives away the ending: He got a summons and decided to fight it. He lost in front of the Transit Adjudication Bureau. He broke no rules and no laws, and he shouldn’t have received a summons. Then the TAB failed. To me, that’s concerning. Josh and I exchanged emails this week concerning his plight, and his story is a by-the-books example of transit justice gone wrong. The 6 train Patchus boarded announced “This is the last downtown stop on this train, the Next stop on this train is the Brooklyn Bridge/City Hall on the uptown platform.” That’s a clear sign that it’s safe to stay on. The train left Brooklyn Bridge and proceeded through the City Hall Loop without stopping. As Josh explained to me, it took about as long to go from the downtown platform to the uptown platform as it did for the train to go from Canal St. to Brooklyn Bridge. Now, clearly, the TAB was wrong. There was no overhead announcement because it wasn’t a violation of any rule to ride through the City Hall Loop. The summons is more defensible because these things happen for a variety of reasons. Maybe the cops were new to the beat; maybe they weren’t trained. The MTA has since assured me that the agency will work closely with the precincts to ensure riders are not ticketed for riding through the Loop. What happened with the TAB raises serious concerns though. The TAB’s own procedures require the ticketing officer to prove that the respondent — in this case Patchus — has violated a rule, and the person receiving the summons can then dispute this claim. It’s the bedrock American principle of innocent until proven guilty. It doesn’t seem as though the TAB adjudicator cared much for this procedure or for the rules, and a ticket for something that isn’t a ticketable offense was upheld. Now, for Patchus, all’s well that ends well as the MTA plans to get his case dismissed, but that happened only after reporters started sniffing around the story. Patchus had in fact planned to appeal, a move that would have cost him more time. The MTA couldn’t provide much information on how TAB got this wrong, but I wouldn’t be too thrilled to have to fight an improperly issued ticket only to see it upheld. The system seems broken, and outside of concerns over the constitutionality of TAB proceedings, the consequences have real costs for subway riders. You see that cat up there? As kittens go, it’s a pretty cute one, and it seems to be a fan of the subway. But what if that cat were responsible for a two-hour subway shutdown? What if you missed a doctor’s appointment, a lunch date or an airplane because this cat was prancing around the subway tracks? Earlier today, the MTA severed third rail power to the Brighton Line for nearly an hour and a half as MTA employees tried to corral this kitty and another off the tracks. There was no B or Q service from DeKalb Ave. to Brighton Beach from shortly after 11 a.m. until 12:45 p.m. when trains began running local. Full service was restored a little after 1 p.m., two hours after the ordeal began, and the cats escaped rescue. It’s not immediately clear how many people were delayed for this failed mission. The MTA ran some buses while subway service was out, but the Q and B lines run under and next to some rather slow-moving stretches of road in Brooklyn. Is it worth it? On the one hand, everybody loves cute kittens; on the other hand, subway service was completely shutdown on a key artery for nearly two hours. Call me heartless, but I think it fails the cost-benefit test. When the state of New York forced the MTA to rename the Brooklyn Battery Tunnel after one-time Governor Hugh Carey, I derided the move. It replaced a useful geographical name with the moniker of someone who served the state over 30 years ago. He had a long and distinguished career, but did we truly have to name a piece of infrastructure after him? This week the move came back to bite the MTA in a rather hilarious way. As the Advance of Staten Island noticed, while programming in a service alert earlier this week, a hapless MTA employee accidentally termed it the Hugh Grant Tunnel. A screenshot of the error is below. The Brooklyn Battery Tunnel was not, sadly, renamed for an actor once named sexiest man alive. The MTA rushed to correct the error, but it will go down in the annals of the Internet as a classic one and a prime example of the errors that can happen when bold-faced names end up on tunnels. In related news, are you ready for the closure of the R train’s Montalban Tunnel this weekend? As part of the MTA’s effort at making travel easier for parents with small children, kids 44 inches tall and under may ride the subways and buses for free when accompanied by an adult, but this rule has some strange consequences. The problem, as one Staten Island Council member recently noted, is that height isn’t consistent across ages. As growth charts show, some kids may reach 44 inches at 4 while others may not get there until almost 7 years of age. Debi Rose wants the MTA to address this problem by moving toward an age-based solution. Based on the 50th percentile on the height charts, children five and under can ride for free. “Due to healthy eating and diet, and the fact that some families are just predisposed towards height — towards tallness — they are being charged the full fare for children who look like they’re older than 5, but in essence are not,” Rose said to the Staten Island Advance. Of course, age is just as challenging to enforce as a height limit. Kids taller than 44 inches frequently pop under the turnstiles, often at the urging of their parents, and there’s no real way for a bus driver to ascertain a child’s age. Still, for those that embrace the honor system, an age limit seems more reasonable than a height limit, no? 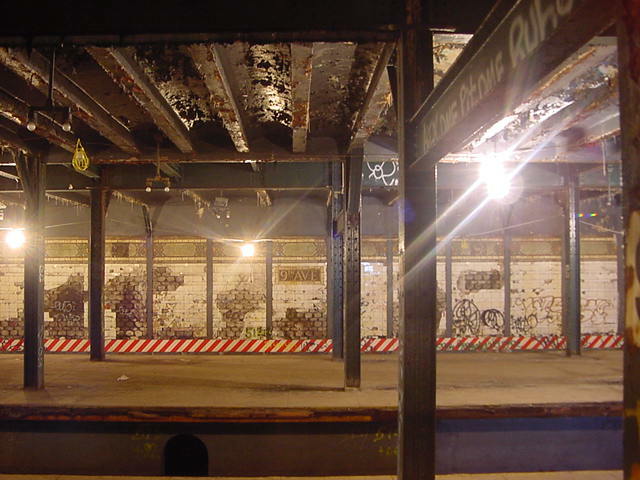 The abandoned 9th Ave. platform, seen here 2002, poses a variety of structural concerns, according to a recent Inspector General report. Photo via NYC Subway. Over the years, we’ve heard a lot about the two intertwined MTA issues: deferred maintenance and sloppy inspection efforts. The city’s subway network suffered for decades from deferred maintenance, and the agency has struggled to maintain even a state of mediocre repair, let alone a good one. Meanwhile, falsified signal inspection efforts have led to multiple arrests in an ongoing scandal. Now, a new MTA Inspector General’s report sheds light on insufficient structural inspections as well further highlighting the problems with and challenges facing the MTA. The report and the ongoing discussions with your office during the analysis have been instrumental in helping us look at our overall responsibilities related to structural inspections in a way that will help ensure we not only address any/all deficiencies, but also get the maximum benefit from [our inspections]. We are in agreement with the substance of your findings and all recommendations and are taking a number of actions with respect to the structural inspection process at NYC Transit. And now some details. From a top-line perspective, the IG found that inspections that should have been conducted annually weren’t happening on time, that no one at Transit was responsible for the Rockaway Viaduct inspections, that inspections of “hard-to-reach station ceilings” were already two years behind schedule, and that abandoned sections of stations that currently provide structural support to active parts haven’t been inspected. If this is now making you fear that your next train is going to tumble off an elevated bridge when the structural supports fail, I don’t completely blame you. How the inspectors missed these problems is even more damning. Essentially, they didn’t do a thorough job. The corrosion was evident from the station platforms, and the Inspector General concluded that MOW inspectors “‘had not focused’ on elevated-station-related defects for the past several years…because its inspectors had erroneously believed that Station Maintenance was responsible for conducting these inspections.” This is a classic left hand-right hand problem with potentially serious consequences. The other explanations follow suit. We know there are issues with vaulted ceilings as we’ve seen them collapse. We know New York City’s bridges are structural deficient because it’s been in the news for years. One aspect of the report, though, struck me as particularly short-sighted, and that area concerns the former 9th Ave. terminal of the Culver Shuttle. According to the Inspector General, the MTA “does not inspect all structures that are no longer used to provide service to passengers but that still serve as supports for structures above or adjacent to them.” Pick your jaw up off the floor, and I’ll continue. “Most such structures,” the report explains, “are abandoned sections of stations that support structures above, such as active stations, tracks, buildings, or streets.” One is an abandoned station at 9th Ave. on the D train’s West End line. During our review of the West End Rehabilitation, we asked the Chief Engineer about the condition of the lower level of the 9th Avenue Station in Brooklyn, which is part of the West End Line, but has been abandoned since 1975. The lower level supports the upper, active level of the station, including its platforms and tracks. The Chief Engineer told us that personnel from MOW Engineering have been inspecting the lower level on an annual basis. He added that the structure is deteriorated in that it has dozens of “A” defects. He also acknowledged that MOW has known for decades that the structure was in need of repair but had not corrected the conditions. When we asked the Chief Engineer why MOW had allowed the condition to persist for years, he had no explanation. However, he noted that while the structure was in need of immediate repair, in his judgment structural collapse was not imminent because it was “overengineered.” The general superintendent for iron operations26 echoed this view, and also told us that the station was further protected by the five mile-per-hour speed restrictions placed on trains because of the curve in track just south of the station. After the IG started poking around, the MTA initiated a $20 million repair program to shore up the station supports. When push came to shove, the money materialized. Ultimately, this moral of this report is one that urges caution and structural soundness, two elements we should expect out of a subway system tasked with moving millions. It also highlights the physical dangers of deferred maintenance. The MTA faces a crushing backlog of good repair projects and simply cannot keep up with demand. Even as Transit vows to improve its inspection efforts, delayed repairs will mount. As the report says, “In our view, NYC Transit simply can no longer tolerate the continued risk presented by critical structure-inspection deficiencies that safety-related structural defects will go undetected and unaddressed.” In other words, better safe than sorry. In what is possibly the weirdest MTA-related story in years, DNA Info reports today that the 7 line extension is safe from electric eels. Now, an astute reader may be wondering how this came about a year before the project is due to wrap and why anyone would be focusing on electric eels in the first place. Well, the story is quite strange. As Jill Colvin reports, MTA Board Member Charlie Moerdler raised the issue at a recent board member when he claimed to remember eels coming ashore and wreaking havoc on metal pipes during construction of the Javits Center. Moerdler helped the Javits Center secure an exemption to New York’s plumbing rules, and the convention center received permission to use plastic piping. “That’s the issue. Does it apply to the 7 line and does it apply to the area where the Hudson Yards is?” he asked. Colvin dug up the March 1980 Final Environmental Impact Statement for the Javits Center and could find no mention of electric eels raising any alarms. She also spoke with the eel project coordinator at the Hudson River Eel Project who said that electric eels do not live in New York Harbor or the Hudson River. “I don’t think you have to worry about electric eel damage,” Chris Bowser said. The MTA, meanwhile, has no plans to to eel-proof the West Side subway extension, and I for one am glad that’s settled. The MTA’s various elevators do not have the most sterling of reputations. The ones necessary to leave deep stations in Upper Manhattan and Clark St. are dismal and foreboding. Many of the newer ones smell bad, and they’re breaking down constantly. Sometimes, those two problems are related. Enter the LIRR’s Woodside elevator. Earlier this week, LIRR President Helena Williams shared some gruesome details about this lift. Calling it a “vertical urinal,” Williams explained how this elevator is going to need to be replaced because too many people have peed in it. According to LIRR figures, the elevator was functional only 58 percent of the time last month, lowest in the system, and no one is too pleased to have to ride it. Strangely enough, as DNA Info notes, the station complex has five other elevators that aren’t nearly as contaminated and public restrooms as well. Though, whether or not you’d actually want to use those restrooms is a very personal decision. But no matter the answer, please just stop peeing on the transit system’s escalators.